Isabel of Castile and Ferdinand of Aragon – known as the Catholic Monarchs – ruled Spain in the fifteenth/sixteenth century period that bridged the medieval era and the Renaissance. Their reign is seen as one of the most significant periods of history both in Spain and in the rest of Europe and the New World. 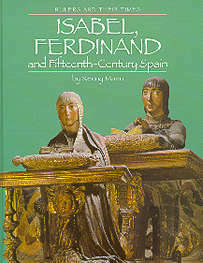 Isabel and Ferdinand were extraordinary individuals who were wholly united in their marriage. They managed to unite the many disparate kingdoms and provinces that made up the Iberian Peninsula in the Fifteenth-Century, forming the bedrock for modern Spain. They reduced the power of the nobility in Castile while gaining for the Crown almost absolute power. They encouraged the arts and letters, and ushered in a new age of brilliance and prosperity for Spain. They also funded Christopher Columbus’s epic journey to the Indies, thus opening up the New World to European trade and exploration and affording Spain untold wealth in gold, silver and other goods from the Americas. At the same time, the monarchs initiated the terrible Spanish Inquisition in an effort to cleanse Spain of so-called heretics. For the same reasons, they expelled the Jews from Spain and drove the Muslims from their last stronghold in the kingdom of Granada. This richly illustrated book briefly outlines these events. Readers will also learn how ordinary people lived and thought during this era, and how historians evaluate the period today.